Wooden baby grip rings from LEGLER for exploring baby’s senses. This toy is safe and free of toxic substances. Hold on to it! 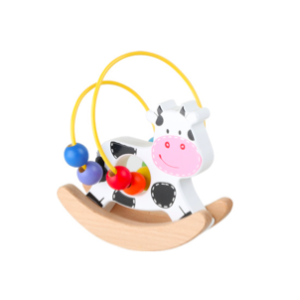 This grip toy amuses babies as soon as they pick it up thanks to the three movable rings in wonderful colours. This grip toy, made of sanded and polished wood, fits wonderfully in babies’ hands, makes a clattering sound when shaken, and is simply a friend to all the senses! It can be put in babies’ mouths without concern due to the saliva-proof paints. Only a damp towel is needed to clean it. This grip toy with the cute sheep Lotta will quickly become young children´s favorite toy!